The math menu allows users to enable and disable various automatic calculations like signal frequency, amplitude, etc. Channel - The input channel to use as the signal source for the operation. Frequency - Calculate the frequency of a periodic signal. Amplitude - Calculate the amplitude of the signal. Maximum - Calculate the maximum value of the signal. 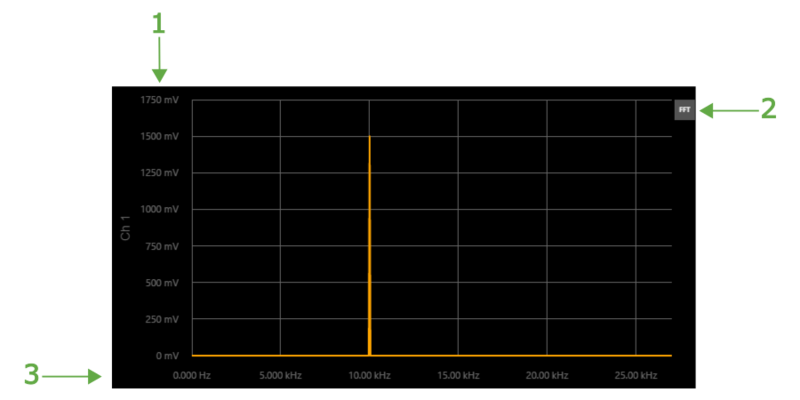 Mean - Calculate the mean value of the signal. Period - Calculate the period of a periodic signal. 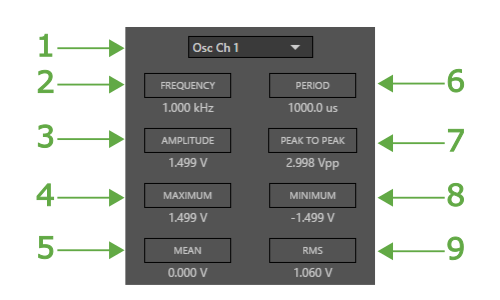 Peak to Peak - Calculate the peak-to-peak voltage of the signal. Minimum - Calculate the minimum value of the signal. RMS - Calculate the Root Mean Square of the signal. The cursors window allows users to enable and configure cursors on the chart. Cursors can be used to measure time, signal values and differences between points. Type - The cursor type: Time, Track or Voltage. 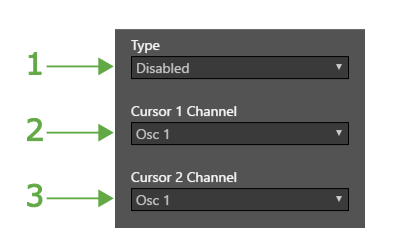 Cursor 1 - The channel to attach cursor 1. The FFT window displays the fast Fourier transform of the current buffer. FFT - Toggle FFT mode on / off.